My wife was stung today by a saddleback caterpillar, which we had never seen or heard of before. We captured it and put it in a jar. We immediately identified it by Googling images for ‘stinging caterpillar’. Of all the hits we got when we Googled ‘saddleback caterpillar sting treatment’ (or something like that), yours was the very best and most helpful. Good work! I am sorry you are now getting them your way. The first time one stung me I was knocked off my feet! I live in Indiana and stepped on one this morning and it was awful!!! Why are they in Indiana?? Just got stung today. Not fun. Live in southwest PA. Stung today on the legs. It was on a hydrangea behind the house. Like stepping in a red ant bed, but you can’t stop the burning. Took 4 Benadryl, used tape, bathed, and applied baking soda. It was scary. Stung yesterday in Georgia, little fella’s were on the under side of a blue berry leaf. Talk about hurt! Thought I’d been stung by a bee until I saw the little hairs. A few years ago I was pulling out old corn stalks in the yard , no gloves. I was reaching for a stalk …..and there was a saddleback. Fortunately I did not grab it. It is a pretty fellow and I took some pictures. I notice from comments they seem to appear in August -Sept. Let’s be careful. Good site. Thank you. Bingo! Adhesive tape, soap and water, baking soda poultice, and Benadryl toned down my sting. Add blueberry bushes to the list. Fifty-four years ago my mother encountered this little horned beast while picking corn in our family garden. She had a severe allergic reaction, going into anaphylactic shock, nearly dying. Dad had farmed all his life and never seen one around here. We named them “pack saddle bugs” because they appeared to be packing a saddle. Also put several into glass jars and took into town for identification. No one in the farm or feed stores had seen there before. Thank you for the excellent article which I truly needed after being stung on the arm. 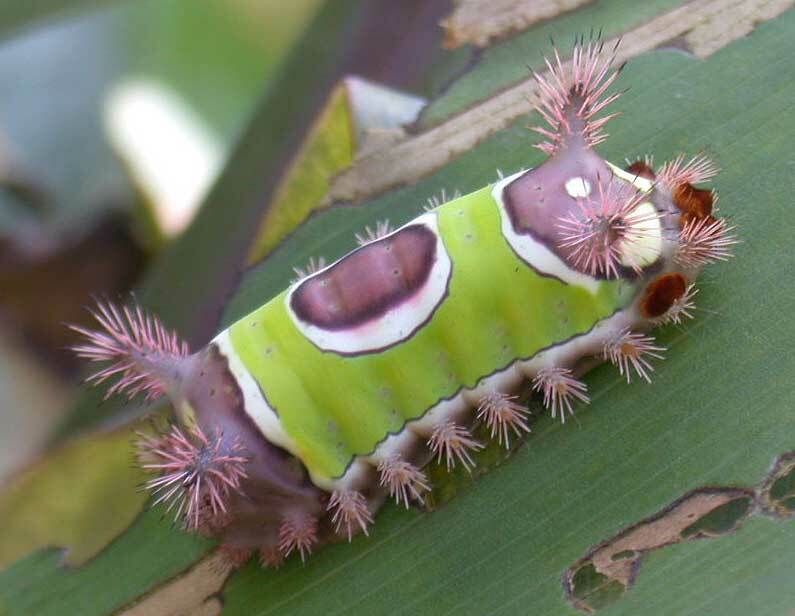 Didn’t see the caterpillar under a leaf on a plant in Puerto Vallarta, Mexico and brushed up against it. WOW! red hot pokers. I ran water on it, applied Listerine mouth wash and then found your article. I used the tape and baking soda and 1/2 hour later there are still welts and it is still stinging! Going to go get an anti-histamine. Thank you for the wonderful advice. Found one in McIntosh County , Georgia. Did not touch, but took a picture. Thanks for all of the information. I am over sixty years old and have never seen one of these insects in this area.